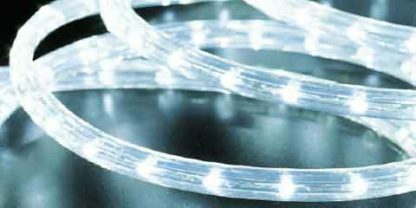 Super Bright 12V DC 1/2″ (13mm) LED Rope Light is a decorative lighting with a weather resistant PVC tube suitable for outdoor use. Easy to outline and is ideal for perimeter building outline lighting, amusement themes, holiday light sculptures, cove lighting, architectural lighting, trade show lighting, bars, and night clubs. Low voltage Rope Lighting (12v) can be cut to size by licensed electricians at marked intervals with Class 2 power supplies (fused). The optional U-Channel track allows you to create straight building perimeter outlines on most surfaces (adhesives or screws): attach LED Rope lighting into track for easy mounting and straight professional looking lines of lighting. Max run Length for 12VDC LED Rope light is 50 feet due to voltage drop.